A psychological first-person horror from the Polish developer studio Bloober Team, known best for another horror game, entitled Layers of Fear. Observer is set in a cyberpunk universe, in Cracow of 2048.
publisher : Aspyr Media, Inc. Released for PC, PS4 and XONE, Observer is a first-person psychological horror from Polish development studio Bloober Team, known best for another horror game, entitled Layers of Fear. Observer is set in a dystopian vision of the future, in Cracow of 2048. The player assumes the role of Daniel Lazarski (starred by Rutger Hauer, the actor known from the film Blade Runner), one of neuro detectives called Observers, able to hack into the minds of suspects. He works for an elite police unit funded by the powerful Chiron Corporation. The game’s story starts when the main hero receives a letter from his missing son, who turns out to be a high-ranking engineer working for Chiron Corporation. The protagonist picks up the investigation that takes him to the slums of Cracow and forces him to relive dark memories and nightmares of both criminals and their victims. 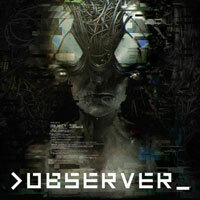 Observer for PC, PS4 and XONE is a first-person adventure game based on survival horror mechanics. Most of the time the player explores grim locations and interacts with characters encountered on the way. An important aspect of gameplay are sequences in which the protagonist hacks into minds of suspects and becomes part of their nightmares, originating from their deepest fears. In those moments the game resembles a classic survival horror, in which you witness disturbing, paranormal events and avoid deadly dangers.